At Thursday, March 28, the single currency has once again updated its low against the US dollar. 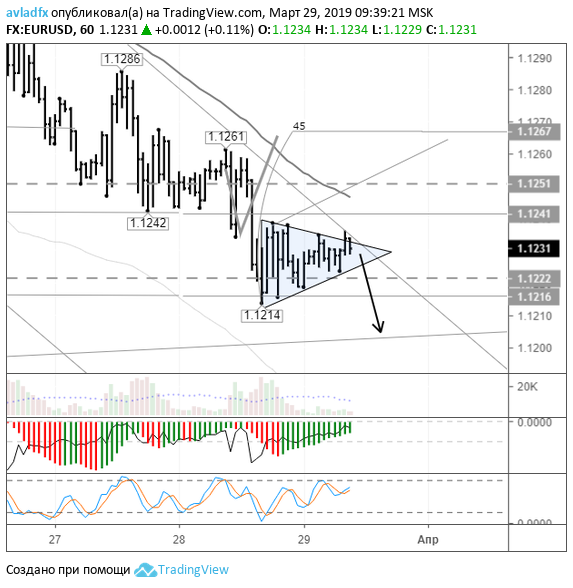 EUR / USD The pair has formed a base at the level of 1.1214. During the North American session, the price of EURUSD rose to 1.1236, and then moved into a sideways trend, in which it is present. The weakening of major currencies held against the background of recovery in the US dollar index to the level of 97.30. Strengthening of the US currency led to risk aversion and profitability growth Treasuries. The yield on US Treasury bonds increased from 2.35% to 2.41%. At 11:55 Germany will report on changes in the unemployment rate and the number of unemployed in March. At 12:30 Britain will publish data on balance of payments, GDP and the volume of investments for the IV quarter, as well as the volume of net loans to individuals and the number of approved applications for a mortgage loan in February. At 13:00 the Eurozone will release the consumer price index for March. At 15:30 Canada will release GDP data for January and the producer price index for February, the US will release data on changes in expenditures and incomes for February. At 16:45 in the US will be released PMI Chicago in March. At 17:00 the US announced a change in the sales of new buildings in February and will release consumer sentiment index from Reuters / Michigan for March. At 20:00 Baker Hughes will report data on the number of active drilling rigs for oil production. With the opening of trading in Europe "bears» EURUSD went on the offensive and under 1.1240 foiled foot. EURUSD from 1.1234 buyers bought the entire sentence. With the fall of 1.1259 has resumed with renewed vigor. Now we have a similar situation - the consolidation at the level of 1.1229. Before going up, EURUSD price can go beyond 1.1339. Disrupt the foot and then sink into 1.1214. "Bearish" trend is weakening. EURUSD sales are risky. Today, market participants' attention is directed to the results of the vote in the Parliament of Great Britain. March 29, she should withdraw from the EU. Agreement on the door has not yet been adopted. In Beijing attended by representatives of the United States for the next round of trade negotiations. Next week, the talks will continue in Washington. China is ready to make concessions, so check out the headlines. Progress in the negotiations - is the growth of risky assets and the strengthening of the euro. If you rely on technical analysis, the sellers do not normally give correct euro as the focus on 1.1205. I think that about 1.1200 to begin profit taking on short positions.